I was shopping for a baby gift for a friend who recently found out she’s having a girl. She’s over the moon about her pregnancy, and, her excitement being as infectious as it is, lead me into a cute baby boutique a few blocks from my apartment to browse and perhaps buy a gift for said unborn child. But, quite unexpectedly, I found it. The dress that I had get for the friend’s baby. The dress that I had to get for every girl baby in the world. The dress I had to get for my baby. Wait. What? The baby I don’t have and, until that moment, wasn’t sure if I would ever want to have. But life is funny. 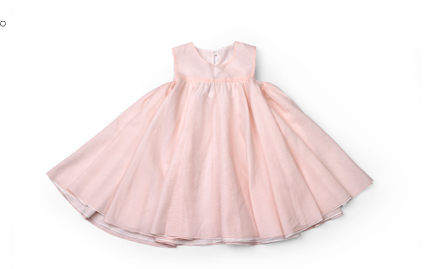 My future flashed before me bathed in a pale pink cotton/silk blend with a round neck, tank sleeves, and a bell shape. I suddenly wanted a child more than anything else in the world. Someone who may or may not share my DNA, but a little person with thoughts, opinions and feelings that have a voice all their own, but sprinkled with my influence. A male friend of mine recently told me his feelings on becoming a dad for the second time: ”I never thought I would be the parenting type, but for some reason, it really suits me. I like the idea of being able to control some small piece of the world, but do it from an egoless and selfless place. That’s nice.” In that moment, standing there holding a tiny dress meant for a six month old girl, I got what he was saying. I kept the dress out on the chair for a few days. I got used to it being there, of walking by it every time I entered the living room. But then, I realized, it’s not mine. It’s a gift that will leave my hands and travel across the country to live a life and be worn, with love. I folded the dress carefully, wrapped it in tissue paper and placed it in a box. I wrapped the box in bright pink and white floral paper, tying it with a pale blue bow. I wrote out the card to my friend, telling her: “your greatest story is about to be written.” Her story is coming soon. Mine is still being outlined.